gave a stellar concert at Caroline Church in East Setauket on Saturday, with works by Gabrieli, Brahms, Koestier, Meyer, Böhme, Monk and Tower. 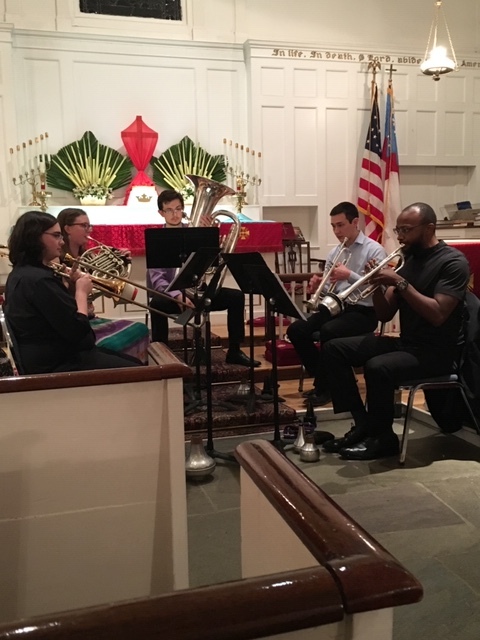 The members are Stephen McLean and Tom Pang, trumpets ; Ryan Hayward, tuba, Michael Lockwood, trombone, and Elizabeth Schmidt, horn. All are graduate students in the DMA or MA programs in performance at Stony Brook University. Each player had the opportunity to introduce a work on the program, by providing some historical or biographical information, or by demonstrating some key features of the piece. The research behind these introductions was accomplished in part by consulting the collections and resources of the Music Library. Stony Brook Brass is one of the ensembles presented by the Three Village Chamber Players, who strive “to be an essential source of artistry in Suffolk County by embedding music performance in spaces that are central to the community.”[i] The concert was repeated on Sunday in Southold, and streamed live via Facebook and Youtube, showing how technology is helping the arts reach audiences outside of traditional venues. The concert remains available for viewing at: https://m.facebook.com/3vchamberplayers/ Congratulations all! [i] Three Village Chamber Players web site, https://www.3vcp.org/about, accessed 4/15/19.